The upper fabrics were able to cover the foot securely and comfortably, wrote testers. Reviewers generally appreciated the upper unit, which was soft and non-irritating to the skin. Many runners enjoyed the vibrant color schemes of the Brooks Launch 3, noting that they enhanced its aesthetic appeal. It felt adequately lightweight for a lot of those who tried it. This model had become the ‘go-to’ running shoe for runners; they stated that it didn’t mar their performance in any way. Several testers who frequently complained of knee and muscle pains when running actually commented that wearing this shoe prevented the occurrence of such discomforts. The cushioning system was sufficiently responsive, according to many reviewers. Many consumers were happy about the general durability of the Brooks Launch 3. Some runners noticed that the upper unit began to lose its threading after a few uses. Others noted that it was one size smaller than their regular choices. A number of testers wrote that the toe box was a tad narrow, causing their toes to clump together uncomfortably. Generally, the Brooks Launch 3 was lauded by its purchasers. It satisfied the cushioning needs of neutral runners. For most of them, it delivered well when it comes to its visual flair and its overall efficacy. But it felt small and narrow for a number of users. Some noted that the durability of the upper fabrics wasn’t able to leave a good impression. Still, a lot of runners were able to enjoy the service of this road shoe. Brooks was founded in 1914 in Philadelphia, Pennsylvania, U.S.A. by Mr. Morris Goldenberg and is presently located in the city of Seattle, Washington U.S.A. The Brooks Launch 3 is a medium weight cushioned road shoe. It was amazing to witness the power of the people who spoke loudly to Brooks when the Launch production was stopped after only one year. The Launch came back. I saw a pair of Red Launch 3 for less than $ 50.00 at RunningWarehouse.com, and I would call that a great value. I am very impressed by the clean and bright colors of red, white and black, the colors of the national flag of Trinidad - Tobago. As perfect as any man-made thing could be, uncomplicated and purposeful. With very few stitches and none where you would object to, but with many very thin overlays in the right places to help give this shoe some shape. Normally hidden, the stitches under sock liner are nearly perfect. 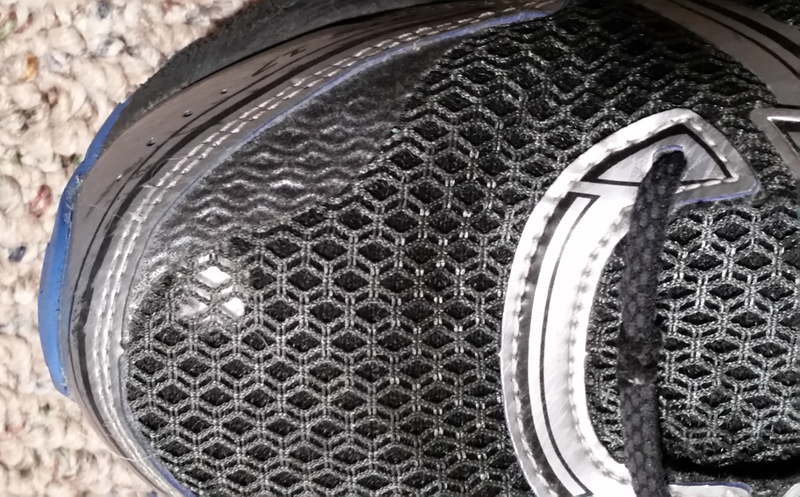 Excellent engineered mesh with 3D printed overlays, well ventilated for the summer months. I can wiggle my toes and see my white socks moving through the forefoot upper. The tongue is well padded and stays in place. Laces are oval shaped, somewhat elastic and stay tied. The collar is not over-stuffed, ankles do not rub as with the overly plush Glycerin model I had to drive 130 miles to return for that very reason. No reflectors except one small spot on the tongue. It is not wise to rely on reflectors for safety because drivers are not looking! And when they do look, never expect a driver to do the expected! The battle of the gels vs. foams vs. BioMoGo DNA, waveplates, DynaFlyte, and Boost goes on; only time will tell who the winners will be. There is not a lot of big thick rubber in the heel, so don't run there. The mid and forefoot have plenty of rubber. The Launch uses BioMoGo and DNA which is a testimony to excellence in engineering and innovation at Brooks. Flexibility is high (easy to flex) which helps me move my 148 lbs/67 kg forward with less effort than with the bigger shoes. My first run in these shoes was at 5 AM on a foggy morning, the sensation of speed is greatest at these hours in the fog. The Launch 3 runs smoothly, midfoot striking and with a flawless roll to toe-off. One look at the outsole shows the engineers have been busy, with a cool crossover pattern and plenty of rubber helping transition and traction. High abrasion rubber in the heel and softer quieter rubber elsewhere. Leg speed, turnover is remarkable, my speed was far greater with these Launch 3 than in the 12 oz. models. Running in some of the bigger models with too much cushioning and too many grams of weight is like having a one-speed bicycle in the Alps, the Launch gives me the lower gears I need. My confidence has soared with these shoes as simple pleasures of running! These are my third pair of Brooks Launch shoes, and they came at a good time as I am a bit worn out from using big shoes. The bigger shoes are good trainers, but there is no better running sensation than with the Launch. Sometimes less is more! Thank you for taking your time to read this review, now get out and run happy! This is a comparison review, made necessary, by the failure of the very shoes I had intended to run with the incoming U.S. Air Force Half Marathon. As you recall, the Brooks Adrenaline GTS 17 had won the hotly contested faceoff with the Asics Kayano 24, conducted by me only a month earlier…on this very site. See review here. However, while training for the big race, I began to notice a hole developing in the upper, directly above the big toe of my left foot of the Brooks Adrenaline GTS 17. The Adrenaline GTS outer soles were yet to show wear but the uppers were worn out with only about 175 miles of easy running! By comparison, I had a pair of Nike Flex run 2013 that lasted for 2 half marathons, many miles of training and then several years on the sales floor at work before crumbling, I expected more from the famous Brooks Adrenaline GTS. Naturally, I was forced to select another pair of shoes for the big day, which was less than 2 weeks away. I couldn't possibly show up at the Air Force Base with my toes sticking out! My options for race day seemed to be between the Brooks Launch 3 and the Brooks Revel. Both shoes are neutral road shoes with the same reliable and proven BioMoGo-DNA midsole, both models also have a solid footprint where the rubber meets the road. And both came from the same neighborhood in Seattle, however, these two similar neutral brothers are quite different. And both came from the same neighborhood in Seattle, however, these two similar neutral brothers are quite different. The Launch 3 is the third go-around of this model and weighs in at just 28 grams less than the Revel. The Air Force race course is almost totally flat, without even a hint of a hill, a typical airbase, so the weight advantage of the Launch will be only slight. The Revel frees you from the tethers of the 12 and 13-ounce shoes, with the Launch you begin to understand the term "turnover speed", possible only with a light shoe. The Launch is also fairly quiet, nearly as quiet as the Brooks Ghost, running along smoothly and without surprises, hotspots or personality quirks. The aptly named Launch is so comfortable that you seem to almost “launch” yourself out the door and into a new running adventure. A new model from Brooks, introduced July 1, 2017, and believed by many to be a prototype of the replacement for The Ghost, or perhaps Launch. I think Brooks had a bunch of great new ideas, and materials, but would not allow them to be tried on any of their already proven, and successful, Ghost and Glycerin models. Hence, in an attempt to disclose these new products to the running world without risk to an already proven seller. The Revel appeared. I discovered as it turns out, that The Revel is, in fact, a very capable and valid design with worthy innovations that would have been no risk to introduce in the Ghost. The Revel is truly a combination of both function and versatility. This shoe is a great daily trainer that is at home in both the workplace and the café; after its retirement from running. You can also add your old Asics Nimbus or Kayano sock-liners with room to spare. My Revels were subjected to regular use and abuse, with many miles of easy road running before finally being subjected to retail store duty that included more than one paint spill. The Revel runs okay for me. They are very quiet, comfortable and surprisingly durable, very much like the Nike Pegasus. The Revel uppers are a woven material that forms around my bony feet quite comfortably. I would completely understand if Brooks announced that this woven upper material was to become the standard for all new models. It seems the designers of The Revel have not sacrificed toe box space and forefoot roominess. Size tested 12 D U.S. 12 D U.S. I am fairly familiar with both shoe models since first reviewing them and I wonder if the Launch may be too minimal for me at that distance. The Revel, however, is missing some ingredient that makes a shoe go from nice & dependable to something that makes a user smile. I have got to go with the Brooks Launch 3 and work on my form to minimize any discomfort at the half marathon distance, while hoping for sunshine and that those 3 hurricanes are not in Ohio on race day. I might even get a PR, among my old Air Force mates? The Revel will be at home back to the workplace. The Air Force Half marathon was a great experience, I had underestimated the race course, it had some hills and broken and crumbling pavement. The Brooks Launch was a good choice but lacked cushioning for that distance. It is no wonder why there are so many runners wearing Asics at these races. A nice, soft, luxurious upper to go along with its sleekness and its responsive feel. While I had some nits, it's not bad in any way. This is a great shoe. The major enhancement of the Brooks Launch 3 was in its upper. It comes with a new 3D Fit Print upper that increases the shoe’s flexibility without adding weight and affecting the overall shoe structure. This enhanced upper offers a flawless fit. The outsole was also slightly updated. New element was added in the forefoot area to deliver an extra-springy toe-off. It also gives added durability and flexibility. 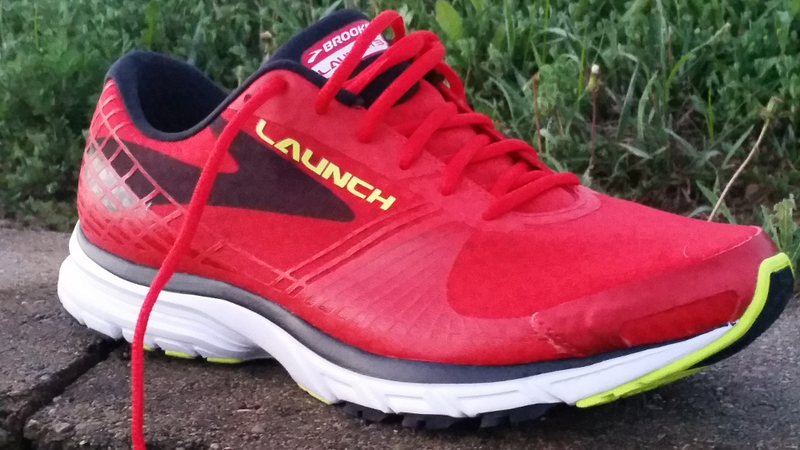 The Launch 3 has a true to size running shoe length. The heel, midfoot and forefoot are of standard measurements, accommodating those with regular foot shapes and measurements. Brooks is offering the shoe under the standard widths of D for the men’s and B for the women’s. The outsole of this Brooks shoe uses the HPR Plus technology that delivers impressive traction on the road. The rubber’s high-abrasion resistant capacity made the outsole to last longer. This works well with forefoot’s blow rubber material that gives added durability and flexibility. The Launch 3 uses the brand’s standard BioMoGo DNA midsole cushioning which is believed to be more reliable than the standard MoGo midsole. It is an environment-friendly alternative that delivers a more flexible and softer running experience. The same ride experience is delivered by the Launch 6 since it uses the same midsole material. The midsole also uses the durable S-257 Cushsole technology that is energy-efficient and serves as insole board for added flexibility and cushioning. The Segmented Crash Pad and midfoot transition zone offers customized cushioning and added stability for a smoother heel-to-toe transition. The enhanced upper features the 3D Fit Print which is strategically stretchable for added flexibility and impressive fit. This works well with the shoe’s Air Mesh upper that keeps the foot well-ventilated. The synthetic overlays deliver a snug and secure fit.